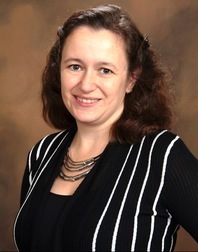 Dr. Polina Sabinin is a mathematics education professor. She loves to help practicing teachers, future teachers, as well as kids and their parents see mathematics as beautiful, understandable, powerful, and … FUN! At Bridgewater State University, through her work on the Games Teachers Play project, she has collected over 100 games which help kids strengthen their mathematical reasoning in interactive and enjoyable ways. Polina has co-authored Smart Cookies (a brain boosting logic game) and is working on an interactive software which will help teachers bring logic into their classrooms. In Georgia, she is researching the mathematics education in primary schools and providing professional development for Games Teachers Play, focusing on logical and spacial reasoning. Polina spent summers in Georgia with her family when she was a child and is very excited to be back this year! ​Dr. Nicole Glen is an elementary science education professor. She loves working with pre-service and in-service teachers to help them experience the wonders of science and the joys of engineering. Most recently, her projects have included teaching her son's first grade classroom how to balance objects, engineer balance toys and tops, and design and build rock walls. At Bridgewater State University, she created a series of science and engineering workshops for the early childhood and elementary education majors. She also enjoys teaching science methods courses, mentoring honors students, and working with the NSF Robert Noyce Science Teacher Scholars program on her campus. She is the mother of a 6 year old son, 3 year old son, and 1 year old daughter. Her husband is an earth science teacher at a local high school. In Georgia, she is researching the engineering education opportunities in primary schools and conducting professional development for teachers using the Engineering is Elementary curriculum from the Museum of Science, Boston. Kate Kummer is a biology and elementary education major and an honors student. Her honors thesis includes interviews with local school administrators and examining science standardized test results in Massachusetts in order to find out how science per pupil expenditure affects science standardized test scores. She has conducted hands-on science activities for young children through a number of public outreach events that the Center for the Advancement of STEM Education offers on campus, including the CityLab biotechnology program and CASE Watershed Access Lab. She is a 21 year old from North Attleboro, MA, and this will be her first trip abroad. In Georgia, she will research the supplies and lessons available and taught to primary students and teachers, particularly in life science, and compare the content they are taught to life science standards from the Next Generation Science Standards. Gary Parmenter is a geography and elementary education major. After a long career in the food service industry, he decided to pursue the career that he always felt was a fit for him. Attending Bridgewater State University in order to become an elementary school teacher will bring him one step closer to his goal of having his own classroom in the near future. Currently, Gary is an assistant at the Hedge Elementary School in Plymouth, MA, to develop his classroom management skill while creating his own lesson plans for his students in the subject of geography. His most recent lesson before leaving for this trip was on the country of Georgia to inform his kindergarten students of where he is going and why. They will await updates and look forward to the lesson he is planning for them upon his return. In Georgia, he will research how mathematical representations are used to teach math and how students' productive struggle is supported by the teachers. Sarah Drinkwater is an earth science and elementary education major. For two summers she has worked at a science camp using Engineering is Elementary curriculum to teach 3rd through 8th grade students. She has experience conducting hands on engineering-based projects with elementary students. She has an associate’s degree in Environmental Studies, which included engineering and energy learning experiences. She enjoys learning about green energy, especially hydro and wind power. In Georgia, she will research the technology access that primary students and their teachers have in schools. She is also interested in learning about the renewable energy resources available in that country. Carolyn Walcott is a Spanish and elementary education major. This will be her first trip abroad, which she is very excited about! In Georgia, she will research how students with special needs are assisted with their mathematics learning, and how teachers use evidence of student thinking to plan and implement mathematics lessons. Our research abroad experience is being generously funded by the Bridgewater State University Shea Fellowship and the Office of Undergraduate Research. In May 2017, we will be returning to Georgia on a study tour. Please contact Dr. Sabinin or Dr. Glen above to learn more about our next trip, and how you can join us!